Kollur located in the Kondapur Taluk in District Udupi, Karnataka, is a small temple town. Situated in the Western Ghat foothills, the town is famous for its Mookambika Temple, a popular Hindu pilgrimage. Also known as Kollapura, the town is 38 kilometers from Kudapur Town. Situated on the banks River Sauparnika, the place is encircled by dense forest and is in the shape of a Sri Chakra. The town is one of the seven mukti places or pilgrimage centers created by Lord Parashurama. The remaining six pilgrimages are located in Kodeshwara, Gokarna, Udupi, Kumbasi, Sankaranarayanan and Subrahmanya. As per a popular belief, penance was performed on this holy place by Saints in ancient times. Mookambika Temple, one of the major temples in the town, is dedicated to supreme goddess Devi Durga and is a significant place of Shakti worship. The goddess is depicted here in the form of a Jyothirlinga, implying the confluence of Both Shiva and Shakti. There are many legends associated with the temple. A demon named Mookasuran, residing in this area wanted to gain powers using his penance. Goddess Parvati was worried to know this and killed Mookasuran with her Chakra on Shukla Ashtami. Since then Goddess Parvati is also known as Mookambika Devi. As per the second legend, Maharishi Kola was fascinated by the vast green pastures and natural beauty of this place and decided to his penance near the Agnitheertha. He opted for a rock to perform his penance. Lord Shiva was happy with Maharishi Kola’s penance and came to bless him. Lord Shiva asked him for his wish, and Maharishi Kola just desired welfare for the mankind. Lord Shiva was happy to know the selflessness of the saint and granted him his wish. The lord also promised that swayambhu Linga will appear every day, for maharishi to worship it. Maharishi desired to worship the Devi Durga also, the Linga got decorated with a Swarna or golden line, symbolizing Shakti or Devi Durga. This golden line divides the Linga into two unequal parts, which even nowadays is visible when reflected sunlight falls on it. The smaller portion represents Brahma, Vishnu and Shiva and bigger portion represents Saraswathi, Lakshmi, and Parvathi. Another unique feature about this place is that it is believed that not just Lord Shiva and Devi Durga reside here, buy other Hindu Gods and Goddesses also live in this Linga in their aroopa form. Hence, the complete celestial congregation is considered to be living in this place. As per another legend, the great saint Adi Shankaracharya was meditating in the Kodachadri hills. Happy with his dedicated worship Devi Durga in form of Sri Mookambika Devi appeared in from of him and asked for his wish. The saint wished to establish her idol in Kerala at a place where he desired to worship her. Devi agreed but laid a condition that she will follow the saint till he reached the destination of his choice. Devi further said that the saint should not look back at her till he reached his desired place. In order to test the saint, Devi purposely stopped the sound of her anklets when they reached in the Kollur area, forcing the saint to look back at her for her well-being. Devi then asked the saint to establish her idol, in Kollur, just as he perceives her. And hence Mookambika Temple was established here by Saint Adi Shankaracharya. It is a popular river spot where tourists come to take a holy dip. Souparnika is just 1 kilometres away from Mookambika Temple. It is a beautiful waterfall located in the middle of the jungle. One needs to trek to reach this waterfall. The location of the waterfall is such that when sun rays fall on its droplets, they depict a beautiful yellow-orange hue. 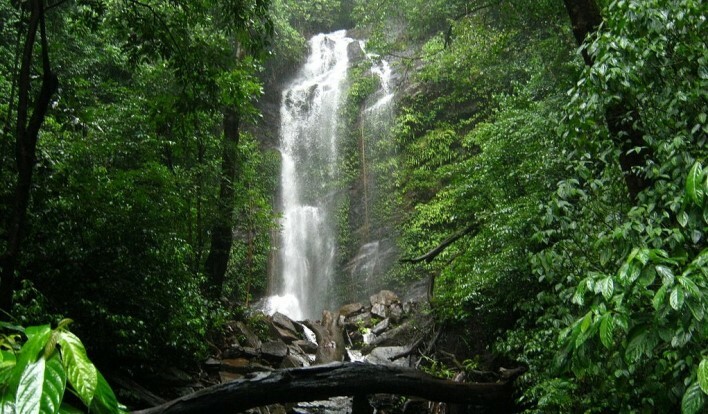 It is due to this that the waterfall got its name as Arishna meaning Turmeric or yellow. A scenic river spot located 1 kilometres from the temple. This river spot has a bridge and great forest trekking opportunities. Spread along the Kundapur-Kollur-Shimoga road, this wildlife sanctuary is abode to endangered species like Lion-Tailed Macaque, Porcupine, Barking Deer, Slender Loris, Leopard, Tiger, Chital, Sambar, Sloth Bear and Otter. This sanctuary is aided by World Wildlife Fund. Dedicated to Lord Ganesh, this temple is one of the most famous temples of Udupi. Located 10 kilometers from Kundpur Railway Station, this temple is believed to fulfill the desires of its devotees. Lord Vinayaka is placed here in a Chaturbhuja or 4-arm posture. A beautiful mountain range located in the Western Ghats region. 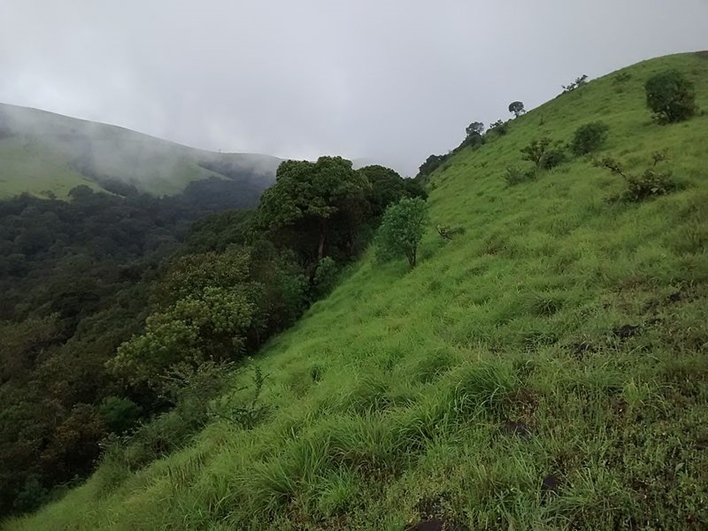 A popular spot for nature lovers, trekkers and rock climbers, a climb to Kodachadri peak offers mesmerizing views of the Linganamakki Backwaters and the Arabian Sea. This mountain region is also a popular photography spot as you can spot several species of flora and fauna here. The nearest airport to the town is Bajpe Airport in Mangalore, which is nearly 106 kilometres away and the best way to reach here. Hubli Airport is the second nearest airport located nearly 170 kilometres away. If you plan to come to the temple town by train, you can take a train till Bijoor Railway Station or till Byndoor Mookambika Road Railway Station. Both the railway stations are located nearly 20 kilometres away from here. If you plan to come to the town by road, you can easily drive down from Mangalore, Bangalore, Mysore and Udupi. You can even take KSRTC buses plying regularly to Kollur from these cities.